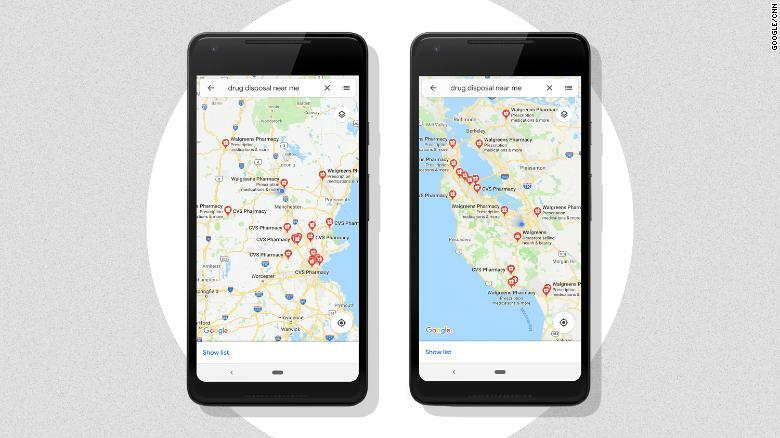 Google Maps is taking steps to help combat the opioid epidemic. On Thursday, the company said it would begin showing people where to discard unneeded medications, at places such as local pharmacies, hospitals and government buildings. Users can type “drug drop off near me” or “medication disposal near me” to see locations on Google Maps. Last month, the company noticed Google searches for “medication disposal near me” reached an all-time high. According to the Centers for Disease Control and Prevention, 130 people die from an opioid overdose every day in the United States. Google, a part of Alphabet (GOOGL), said it has worked with the Drug Enforcement Administration, Department of Health and Human Services, CVS, Walgreens and state governments on the project. Google Maps will show users where to discard medications. The company said it has CVS and Walgreens location data for all 50 states. For seven states — including Arizona, Colorado and Pennsylvania — it has richer data, including hospitals and government buildings like fire stations and police stations. It plans to expand that to more states and locations soon.